A little over two years ago I joined the group of professors Anneke den Hollander and Carel Hoyng to work in the department of Ophthalmology of the Radboud university medical center in Nijmegen, the Netherlands. Our group has a strong track record in clinical aspects and the genetic background of complex eye diseases. Having come from a background of medical biology, I quickly found myself in the middle of what is proving to be an incredible exciting scientific adventure! Although we study many different eye diseases in our group, my emphasis is on the ones that have a multi-factorial etiology. Simply put, this means that there is neither a clear cut genetic cause of the disease, nor a clear cut environmental cause; it is a balance between these two factors. The most well known example of an eye disease that meets these criteria is age-related macular degeneration (AMD). AMD is the most common cause of blindness in the elderly population in the Western world, a result of atrophy of the photoreceptors and pigment epithelium in the back of the eye. About 80% of people have the dry form of the disease which is characterized by the accumulation of waste products underneath the retina, called drusen. About 20% of patients suffer from the wet form, where fragile and leaky blood vessels grow into the retina and dramatically disturb vision (1) (Figure 1). Smoking is a strong risk factor for the disease, as is a poor choice in diet, lack of exercise and - naturally - aging itself. From the genetic perspective, we have learned an incredible amount about AMD since the first genome-wide association study (GWAS) was published ten years ago. This original GWAS identified a genomic locus around the gene coding for an important regulator of the complement system, complement factor H (2). A decade, and several very large GWASs later, 34 genomic loci are now considered to be involved in this disease, providing insight into the biological pathways that associate to it. The original involvement of the complement system has been corroborated through several lines of evidence and our expanding knowledge is now integrating pathways that relate to angiogenesis, extracellular matrix and lipoprotein transport as well (3). Figure 1. 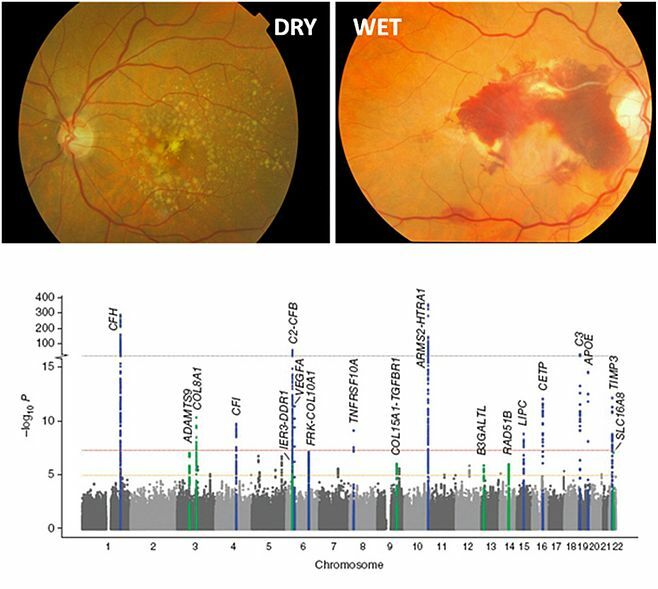 The phenotype of dry (top left) and wet (top right) age-related macular degeneration. In the dry form, punctuate yellow spots appear underneath the retina, indicating accumulations of waste products. In the wet form, fragile and leaky vessels leak into the retina causing bleeding. Bottom image: Genome-wide association Manhattan plot showing several genomic loci to be involved in AMD, reflecting pathways in complement, lipoprotein, extracellular matrix and angiogenesis (reference 3). Our group, together with the university hospital in Cologne, has collected a large database of AMD patients and healthy controls. This database (European Genetic Database; EUGENDA.org) holds medical information, retinal images, detailed questionnaires, blood serum and DNA of over 4000 individuals. Using EUGENDA and through large scale genetic screening we have shown that several rare and highly disruptive genetic variants in the complement system strongly associate to AMD and that these type of variants confer a much higher risk of getting AMD when compared to the genomic loci identified in GWAS (4-6). Moreover, we have built and are building prediction models for the progression speed of the disease and treatment response, including in these models all relevant genetic and environmental data present in EUGENDA. Currently we are gradually transiting from large scale genetic studies to the gathering of other layers of information. There is a considerable gap between the genetic blueprint of an individual and the occurrence of AMD and by means of epi-genetics, metabolomics and other -omics technologies we are developing our insights to fill this gap. Another multi-factorial disorder that is the focus of my attention is chronic central serous chorioretinopathy, which we affectionately dubbed 'serosa' in the department and normally abbreviate in scientific literature to cCSC. The occurrence of cCSC is far less frequent than AMD but the phenotype is quite particular. Also the environmental element is different from AMD: Stress is a major risk factor for cCSC, as is the use of medication that contain steroids. Strikingly, for unknown reasons, men have a far greater chance of developing the disease. Patients that have an episode of cCSC accumulate fluid underneath the retina, dissociating it from the pigment epithelium underneath (Figure 2). This fluid bubble distorts vision. In acute forms of the disease, the fluid is drained away over several months, leaving very little trace of the disease. In chronic cases however, there is considerable recurrence of fluid buildup which can result in permanent vision loss. A familial occurrence of cCSC has been described, suggestive of a genetic component. We are doing targeted genotyping approaches, genome-wide association studies and exome sequencing to find these genetic factors. We have published the first results on this topic (Figure 2 and reference 7), demonstrating a need for correct phenotypic classification of subtypes of cCSC. Moreover, we showed a genetic overlap between cCSC and AMD that warrants further study. Currently, we are in the middle of unveiling more of the genetic underpinnings of this disorder, which we hope will be the starting point for the development of new and effective therapeutic possibilities. The third main topic I work on is that of diabetes-related vision complications. Unmanaged, or poorly managed diabetes can lead to micro-vascular complications that present in the eye as diabetic retinopathies. These range from mild to severe and therapeutic management of diabetic retinopathies is often complicated because of the underlying diabetes. We are generating databases of type 1 diabetic patients, as well as type 2 diabetic patients to study the development of retinopathies in these subjects. We aim to identify retinopathies sooner in these patients and once they have been diagnosed to direct them as quickly as possible to the most effective therapy. We are currently developing the tools and trials to help us pursue these aims and answer questions that are relevant for a rapidly increasing patient population because of the projected increase of diabetes incidence worldwide. Figure 2. The phenotype of chronic central serous chorioretinopathy and genetic associations. Top left – optical coherence tomography (OCT) image of unaffected eye, showing a bright band of layers reflecting the outer most parts of the photoreceptors and the pigment epithelium. The retina above (darker grey) is associated to the pigment epithelium. Top right: In a cCSC patient, the OCT image looks dramatically different: The retina has dissociated from the pigment epithelium and a fluid pocket is present (dark area underneath retina). Bottom image: single nucleotide polymorphisms in the gene coding for complement factor H, a gene strongly involved in AMD are also associated to cCSC. Interestingly, many of the associations have the exact opposite direction in both diseases; if a genetic variation confers risk in AMD, it offers protection against cCSC. Lim LS, Mitchell P, Seddon JM, Holz FG, Wong TY. Age-related macular degeneration. Lancet. 2012 May 5;379(9827):1728-38. Klein RJ, Zeiss C, Chew EY, Tsai JY, Sackler RS et al. Complement factor H polymorphism in age-related macular degeneration. Science. 2005 Apr 15;308(5720):385-9. 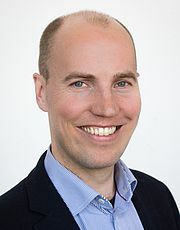 Helgason H, Sulem P, Duvvari MR, Luo H, Thorleifsson G, et al. A rare nonsynonymous sequence variant in C3 is associated with high risk of age-related macular degeneration. Nat Genet. 2013 Nov;45(11):1371-4.